This entry was posted in Events and tagged symposium, water on April 26, 2013 by Wire Eagle. AUBURN UNIVERSITY – A statewide partnership seeking a comprehensive water policy for Alabama will hold a symposium at Auburn University Friday, May 10, to inform Alabamians about current progress and also to solicit public comment. The symposium will be held in 207 Comer Hall Auditorium, from 9:30 a.m. to 3:30 p.m.
Sam Fowler, director of the Auburn University Water Resources Center and a symposium organizer, said he encourages anyone interested in the discussion and development of a comprehensive water policy, whether citizens, stakeholders or elected officials, to attend. This entry was posted in Campus Announcement, Community, Events and tagged immigration, migration, symposium on December 13, 2011 by Wire Eagle. 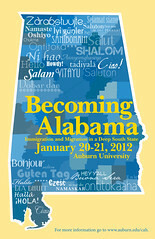 AUBURN – Auburn University’s College of Liberal Arts will host a two-day public symposium, “Becoming Alabama: Immigration and Migration in a Deep South State,” Jan. 20-21 at The Hotel at Auburn University and Dixon Conference Center. The symposium will feature scholars and professionals exploring immigration and migration from Spanish exploration through the 1813 Creek War to the present. Isabel Wilkerson and Carmen Agra Deedy headline a roster of presenters who will provide historical context for the people who moved into, out of and within Alabama during the last 200 years. This entry was posted in Academics, Community, diversity, Events and tagged learning, symposium, teaching on February 2, 2010 by Wire Eagle. AUBURN – Auburn University will host a two-day symposium on “Cross-Cultural Perspectives on University Teaching and Learning” on Feb. 19-20 for higher education faculty members across the state and beyond, as well as its own faculty. In sessions led by international scholars, topics include: managing a multicultural classroom; how culture affects writing; and teaching and learning in higher education in the context of Korean, African American, Hindu, Hispanic, Muslim and Confusian cultural perspectives. This entry was posted in Events, General News and tagged economy, philanthropy, symposium, women on March 6, 2009 by Wire Eagle. AUBURN –The Women’s Philanthropy Board, in Auburn University’s College of Human Sciences, will present its seventh annual Spring Symposium on Monday, April 6, from 8 a.m. to 3 p.m. at The Hotel at Auburn University and Dixon Conference Center. At this year’s symposium on “Navigating the Challenges in Today’s Economy: Preserving Wealth and Pursuing Philanthropy,” business and government leaders will discuss financial and economic issues. Speakers will include Gene L. Dodaro, acting comptroller general for the United States and head of the Government Accountability Office; David Altig, senior vice president and director of research for the Federal Reserve Bank of Atlanta; Burt White, managing director of research for LPL Financial; and U.S. Attorney for the Middle District of Alabama, Leura Canary.